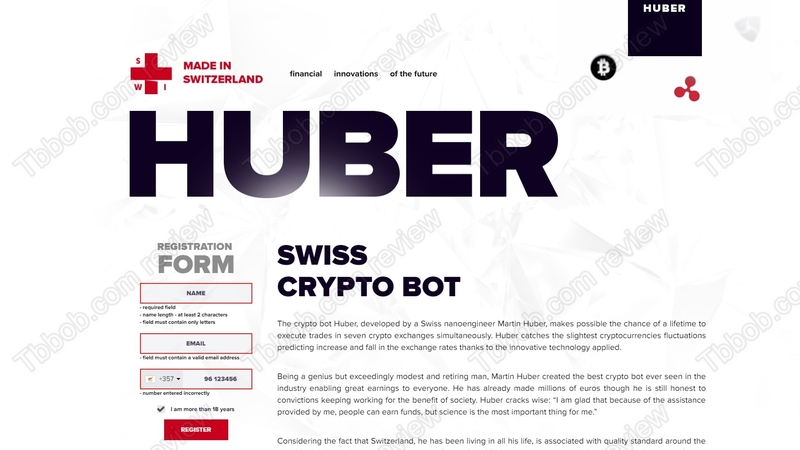 This review explains that Huber Swiss Crypto Bot aka Huberium is a scam. It is presented by Martin Huber. Huber allegedly is a Swiss nanoengineer who developed a cryptocurrency trading robot that can accurately predict price movements. This robot carries his name and supposedly is able to make you money on autopilot. Really? The Huber web page is full of false claims. Martin Huber is fictitious person, there is no Swiss nanoengineer and crypto robot developer of this name. The whole link to Switzerland is fake to, Huber Swiss Crypto Bot has nothing to do with this country. Should there really be a robot able to trade for you, it would have to be licensed in Switzerland. But there is no trace in FINMA’s register of this robot. As we said, in reality Huber doesn’t have anything in common with Switzerland. In fact, real owners of the website remain anonymous. There is no contact information, no real names, nothing, so it is impossible to know who really is behind this program. When you sign up for Huber, the only thing that will happen is that a real trading account will be opened for you with the broker Pratconi. The real aim of Huber is to make you deposit with this broker, because if you do it, people who run this scam will get paid an affiliate commission. Pratconi is a cryptocurrency broker that is not regulated, so you should stay away from it, because your money would not be protected in any way with this broker. Huber Swiss Crypto Bot is a ridiculous scam that will just push you to deposit money with an unregulated broker, it won’t earn you anything. If you want to try to make money with cryptocurrencies, start with a free demo with a regulated broker to learn how it works. You will need a sound strategy and money you can afford to lose, should you start trading with real money one day.